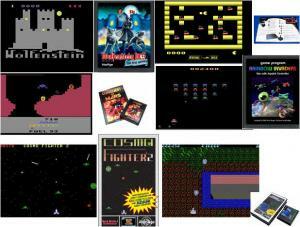 New 2600 and ColecoVision Homebrew Releases! AStar is a new puzzle game for the Atari 2600 by Aaron Curtis, whose first homebrew endeavor was the highly popular Fall Down. AStar is inspired by an old calculator game called DStar. The basic idea is to collect all the items (cherries on the first level), but it's not as easy as it may seem at first! You can only move in a straight line until you hit something. You can then change your direction and again move forward until you hit a wall. You also have control of a small block to that you can use to help you navigate the level. The number of moves you've made is shown at the bottom of the screen. Each level has a minimum number of moves required to complete it, and if you go over this the display will change color. Completing every level in the minimum number of moves (no easy task!) wins the game! Includes cartridge and full-color manual. Available in NTSC and PAL television formats. In the year 4014, the planet Earth and the planet Mars are locked in a century-long war. The Martians have devised a plan to destroy Earth using the power from their latest weapon: the Destructo-Bomb!! The Martian forces have managed to construct five bombs and have placed them deep inside the Martian Caverns, awaiting the final command from their leader to attack!!! Do you have the skill to navigate to the depths of the Martian caverns, active the Destructo-Bombs, and escape before they explode? Good Luck! Conquest of Mars is an accurate translation to the Atari 2600 of a popular Atari 8-bit computer title. Destroy the Martian rebellion by descending through the six caverns of Mars to activate the main energy reactors and escape to the surface before they blow up! Do you have the skill and quick reflexes required to descend into the Martian depths without being annihilated? And once you reach the bottom, can you make it out alive? Includes cartridge and full-color manual. It's the year 3006, and the evil â€œRainbow Invadersâ€ from the planet â€œPaccoâ€, are headed to Earth! They look like the ridiculous aliens depicted in 1980â€™s arcade games, but are extremely dangerous and their goal is to exterminate all humans! You command a fleet of spaceships and you must defeat all of the Invaders to save Earth! Good luck! Rainbow Invaders is a new Space Invaders style game for the Atari 2600 from Italian developer Silvio Mogno. While many games of this nature have been released for the 2600 (to say nothing of the countless Space Invaders hacks), Silvio's game adds a breath of fresh air to the genre. Yes, you are shooting at descending waves of alien invaders, attempting to finish them off before they reach the ground. However, the aliens also periodically drop one of 16 random Special Shots, some of which will help and some of which will hinder your efforts if you catch them. Your ship also features a shield that will make you invulnerable for a few seconds, at the expense of not being able to fire again right away. AtariAge held a Rainbow Invaders Label Contest to design original label artwork for Rainbow Invaders. Nearly 50 entries were received, and one entry from Nathan Strum was chosen as the winner and now graces the Rainbow Invaders label and manual. It is the height of WWII. Germany has conquered most of Europe, and Britain is suffering under constant siege by air. The dark shadow of fascism looms heavy over the free people of the world. You are Sgt. Kozwoski of the Polish special forces. Captured as part of a resistance cell opposing the German and Russian occupation of Poland, you are transported to the dreaded castle Wolfenstein just over the border in Germany for interrogation and execution, or possibly worse. Escape is your first priority, but as a member of the resistance you won't pass up this opportunity to hurt the German war machine and avenge the people of Poland! Return to the halls of dreaded WOLFENSTEIN. All new enemies, rooms and floorplans await you in this upgraded version of the original Wolfenstein VCS. Badder, Brighter and more Deadly! Do you dare brave the depths of Wolfenstein VCS:The Next Mission? Wolfenstein VCS: The Next Mission is based on Venture, extensively modified to bring you an exciting and new gameplay experience! * There are 4 level layouts that repeat twice to make 8 levels rather than 2 layouts repeated 4 times. * Updated some colors to make them brighter. * The patrolling guards have 4 starting positions now. In the original they had only two starting positions. * Picking up the gun or ammo gives you exactly 8 bullets total. So the player can never have more than 8 bullets on hand. This ups the difficulty a pinch. 8 bullets is also the number of bullets in a German Luger pistol, and the max number shown by the ammo bar, so I think it works well. * Fixed a bug in the original for randomizing room contents that made ammo show up either too often or not enough. * The secret level is easier to find. * Updated two zoomed room layouts. One has a minor change, the other has a complete overhaul. * All enemies are animated with 2-frames. * Changed some of the enemies to creatures so it's not just room after room of guards. Wolfenstein VCS: The Next Mission features a brand new, full-color eight-page manual created by Dave Dries, who is also responsible for the beautiful label. Includes cartridge and full-color manual. A giant spaceship is threatening to attack the planet Xunor and capture its inhabitants. As commander of the mighty Cosmo Fighters, you are given the task of eliminating this evil force and returning peace to the galaxy. But this mission wonâ€™t be an easy one! To reach your goal, you must fight your way through various stages, each filled with advanced enemy fighters, grouping together to prevent you from finishing your mission successfully. As commander of the Cosmo Fighters, you have successfully defended the planet Xunor from an Alien Attack in Cosmo Fighter 2. For the latest Atari news, information and discussion, please visit AtariAge.com!